Powder Teff and Barley to fine separately using a blender. Reserve a tbsp of teff flour for further use. In 3.5 cups of lukewarm water add the dry yeast. Slowly add the powders and mix thoroughly without any lumps. Add flours in batches. Cover and keep aside to ferment for at least 12 hours. After 12 hours, remove the water which floats on the batter. Mix the teff flour (which was kept aside for further use) in 1/2 cup water without lump and heat it stirring continuously till it thickens. Remove. Add half a cup of water to it and mix thoroughly. Add this to the fermented batter and give a good mix. Add salt. Keep aside for an hour. The batter should be of dosa batter consistency. In a non stick dosa pan, pour the batter at one end and swirl so that it spreads evenly on the whole pan. Cover and cook on medium flame till it cooks fully. No need to cook the other side. Serve with lentils and veggies. Can u let me know where u got your text grain?? Am searching from a long time. I got the grain from USA. You can try in Amazon.Thanks for visiting. Thanks so much for visiting the site. 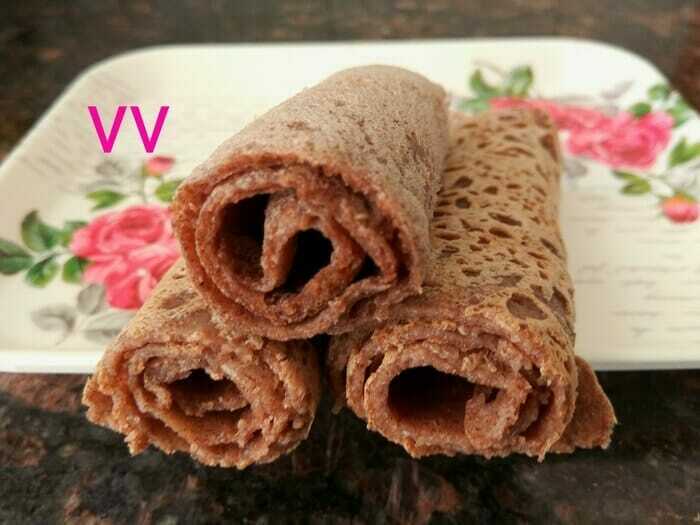 Will share the side dishes recipes of Injera after Diwali. Please bear with me.